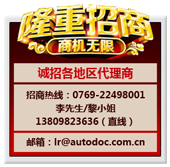 AUTODOC CO., LTD was founded in 1994. In the past 20 years, we have always pursued to develop products with the concept of “health, safety, beauty, and quality". Since then, ATUODOC has become a consumer's beloved and trusted car fragrance brand. With our famous AUTODOC brand and product innovation, we will continue to provide you with more quality products. Welcome to join us.